Upload your smile, fill in the form below and we’ll respond you with a virtual consultation ! Remember that the more descriptive you are, the more effective the email will be. Start by click-ing on the link. Do you consume regularly ? Do you have a disease that can affect the appearance of your teeth ? Have you followed orthodontic treatment ? Do you think that your teeth are a matter of? Are you embarrassed by the appearance of your teeth ? What would you change first of all in the appearance of your teeth ? When you smile or laugh, you fear that the eyes of others is drawn to some aspect of your mouth ? Do you put your hand in front of your mouth when you smile? Do you feel that your teeth are ? Have you broken, damaged or missing teeth ? If yes, are they visible when you smile? Do you find the color of your teeth ? Do you have stains on your teeth? Do you think that your teeth are aligned ? Do you have spaces between teeth ? 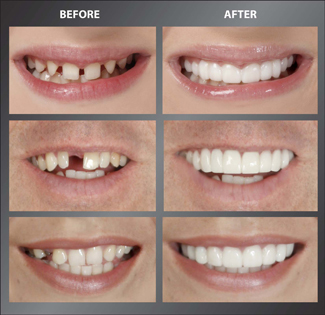 Do you have an incomplete or missing tooth ? Do you have fillings or crowns ? If yes, when you smile, do you see your fillings or crowns ? When you smile, do you find that your gums are ? Are you reluctant to smile ? Do you have a specific request or concern? Upload your smile: Send us your smile and we will respond within 48 hours with a virtual consultation!